I just purchased a few NOS Prism Snapshots. I had a 1.2 and loved flying it so bought a two in bigger sizes. Is there any recommendation for changing line sets based on age? I change mine when they break. I have some sets that are 10+ years old, I see no other reason to change them. Agree with Rob - if it don't break, don't replace. I think some of my dual line sets go back to the mid '90s. Still working fine. Only reason I got some new, was to get some different lengths than what I had. The only warning I know about old kite line is that old kite lines may not be compatible with the new stuff. Dyneema/Spectra are both HMPE line sold under many names like LaserPro Gold line, Shanti Speed line, SkyBond, and more. That's currently the best stuff for sport kites, and probably what you've got. 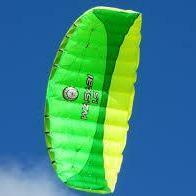 Older sport kites often used Kevlar, and a few places still sell it for high lift kites and special applications. Kevlar rubbing against Kevlar works okay, but it rips up HMPE line when they rub together so don't mix them. Cotton line is cheap and sometimes used with inexpensive kites, it also doesn't play well with others. Same with other types. No matter the type, Kevlar, Dacron, polyester, nylon, cotton, and waxed lines all have their uses but don't mix them when flying with other people. Thank you for the info. The Snapshot foil kites weren't discontinued that long ago plus I have been flying one I bought last spring with no issues. Just curious, thank you. After all the reassurance, I had a line break on the Snapshot 1.9 . I'm guessing total fluke but first day in the air had 15 mph winds with gust over 20 mph. It was tugging me around a good bit. I had been flying for about 30 minutes and bang the right string snapped. 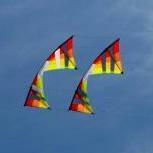 Oh well it was a very fun day on the kite and a new line set was only $20. If your new line set only cost $20, don't expect better from it. Lines are your only connection to the kite, do not cheap out on them. I haven't bought dualie lines in quite a while, but I wouldn't be surprised to see a $50 price tag on them. We regularly pay close to $100 per set for quads. Look for spectra lines, not dacron or polyester. Brand names are Laser Pro Gold. Skybond, or Shanti Speed. I ordered a Prism replacement set. Flew a lot of hours on the original lines with other foils. What is the benefit of high end lines with a foil? Prism lines? Maybe not so bad then. Lines are your only connection to your kite. You can feel it, little gusts, lulls, how it reacts, better with them. Higher end lines also don't stretch as much during flight, again giving you better feel. It might not be quite as important on a foil, but you will definitely feel the difference on the framed kites. If you flew a lot on the original set - quite possible you might have nicked them and they failed due to that. Or they may have just simply worn out. I have older lines I still use today. But I'm careful to match kite and lines to my wind. Look at the lines - are they fuzzy looking? Probably fairly worn. Especially at the point the lines cross each other. Better lines use a tighter weave and handle the "crossing" . As with most things - let your budget be your guide. But try to get the best lines you can afford. Thanks for the input. I set my goals on learning to trick my framed kites this year. The way you explain the feedback, I can see how it would help with tricks. With the foils i'm really just steering it and keeping it off the ground, not a ton of finesse. With the big ones its a battle at times. I love the adrenaline rush of getting dragged around. Knots are weak points to be sure, so the knot you use is important. People have done comparisons of different knots and their breaking strength, you can find many comparisons at climbing web sites since they risk their lives based on the strength of their knots and ropes. Fishing sites also have comparisons of knot breaking strength. In addition to the choice of knot, the sleeve generally improves strength of the knot. Overhand knots are rather weak knots, giving about half the breaking strength, meaning a line that normally breaks at 100 lbs will instead break at around 50 lbs with an unsleeved overhand knot. Adding sleeving will add some strength, but it still breaks relatively easily. That means your 90# line with an unsleeved overhand knot breaks at about 45, your 150# line breaks at about 75, your 300# breaks at 150. Obviously not ideal. A figure 8 loop is only slightly more effort to tie and has a much higher breaking strength, around 70%-80% strength unsleeved and around 90% sleeved, and is the knot most climbers use for their harnesses. If you can spend the time and effort, a splice loop is nearly 100% of full strength, and will be strongest.